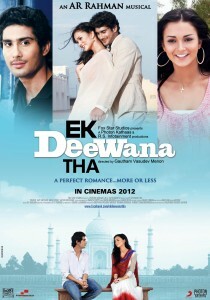 The music for the upcoming love story Ek Deewana Tha, an A. R Rahman and Javed Akhtar musical starring Prateik and British model-turned-actor Amy Jackson will be released on 21st December 2011. Which is a very good thing, but what makes it really special is that the music launch will be held at the Taj Mahal, the ultimate symbol of love. And what makes it even cooler than that is that this special event will include a performance by Maestro A. R. Rahman and Javed Akhtar. Director Gautham Menon will also share his experience of making the musical and stars Prateik and Amy Jackson will also be in attendance. Fans are eagerly awaiting to hear the music for this film especially since many loved the songs that were part of the original version of the film in Tamil: Vinnaithaandi Varuvaayaa.